← Interested in funding for a neighborhood project? Learn more tonight! 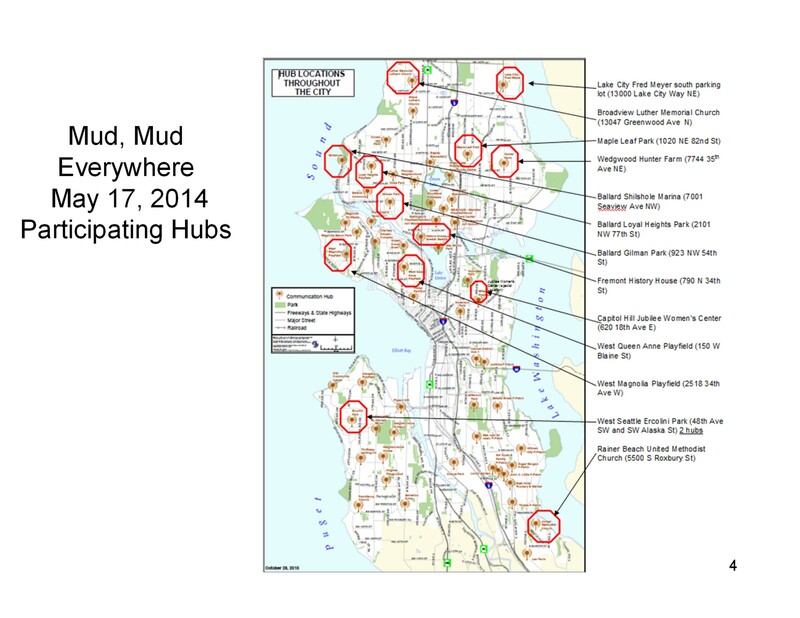 Tomorrow from 9 AM until noon, West Seattle Be Prepared will participate in a citywide emergency communications exercise called “Mud, Mud, Everwhere”. As we noted earlier, we’ll be based at Ercolini Park just west of the Alaska Junction at 4700 SW Alaska Street. Hubs throughout Seattle also plan to participate (see map below), along with other organizations and Seattle ACS (Auxilliary Communication Services). 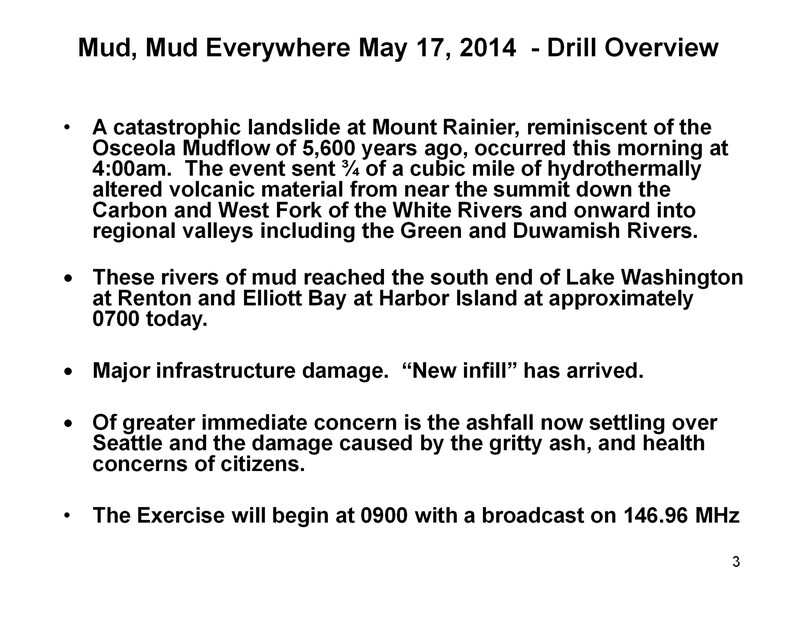 Following is a slide that shows a brief overview of the drill scenario. Visit the “About the Hubs” section of the West Seattle Be Prepared website to learn more about the West Seattle emergency communication hubs, view maps, etc. You can find additional information in the “Resources” section about the hubs in the other communities and about groups. You are more than welcome to come watch tomorrow’s drill in person, and/or follow the drill Twitter feeds, #seattlehubs and #muddydrill, If you have access to either a GMRS or ham radio, tune in to listen! This entry was posted in Announcements, Events, Radio Drills & Field Exercises, West Seattle Be Prepared and tagged communications drill, disaster preparedness, earthquake preparedness, radio drill, West Seattle Emergency Communication Hubs, West Seattle emergency preparedness. Bookmark the permalink.